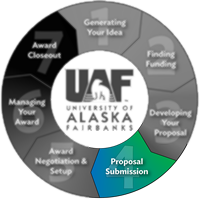 As UAF's authorized institutional office, OGCA staff review and approve all proposals on behalf of the Principal Investigator and the University. OGCA provides a comprehensive pre-submission administrative review to ensure a complete and accurate proposal and compliance with sponsor and UAF institutional policies. At times, OGCA requests changes that will bring the proposal into compliance with guidelines and policies, or suggest changes to enhance funding success. When the proposal is complete, OGCA provides institutional endorsement of the proposal. What Types of Requests Does OGCA Review?